Compared to the last 5 decades, the development of Hemp has come along in leaps and bounds. With Cannabis legalization efforts having strong roots and flourishing around most of the world, we are in the infancy of the future plans for Cannabis. Unfortunately, the times of Prohibition spurred on many rumors about the differences between Marijuana & Hemp. Some rumors were “Marijuana” is the female plants and Hemp are the males. Other old wives tales are Cannabis is a gateway drug and Hemp is not. Bottom line, they are part of the same family and just a subspecies of each other. Hemp was more commonly used in the Western world previous to the 1960’s. It was a very common industrial resource used mainly for fiber, oils and its many other functions. Since “The War on Drugs” was officially launched by the Nixon Administration the final nail in the coffin of cannabis was sown. Outlaw Cannabis growers started seeing a demand for the psychoactive cousin, Marijuana. Marijuana has high profiles of THC or Tetrahydrocannabinol. This cannabinoid is the psychoactive compound that gives Marijuana is “high”. On the other hand, Hemp does not contain high amounts of THC but has high amounts of another cannabinoid called Cannabidiol or CBD. This cannabinoid does not have any psychoactive effects, but since being localized and studied since the turn of the last century, much interest has been shown for its medical applications. There are many varieties of Cannabis in the world. It is generally agreed that Marijuana comes in three distinctive subspecies, Indica, Sativa and Ruderalis. Below these subspecies there are many hybrids and inbred lines (IBL). Variety names include OG Kush, BC Cheese, Durban Poison and thousands of other crossbred strains. Hemp also has many varieties, some grown for their seeds and oil and others grown for their long fibers. The differences between Cannabis strains is similar to tomatoes and potatoes, many different varieties, flavors and tastes. One of the Hemp’s most important functions is providing fiber. The word canvas was originally derived from the word cannabis. Hemp can still be seen today from many historical navies, farming and industrial memorabilia like in the use of sails, ropes, insulation and even clothing. It was only until fairly recently since the development of technology and processes was Cannabis used for making oils. Is There a Difference Between Marijuana & Hemp Oil? There are hundreds of varieties of cannabis oils. Some extracted from Marijuana and some extracted from Hemp. Cannabis oils can also be extracted from the seeds, this is usually done from the Hemp seed which is saturated with the high-value cannabis oils. Hemp-derived oils are usually high in the cannabinoid, CBD as mentioned previously. CBD does not make the user “high” whatsoever but does potentially have a lot of medical applications such as treatment for diseases including cancer, Alzheimer’s, Epilepsy among others and conditions such as depression, PTSD and AD/HD, to name a few. There is great promise in this growing field of research to understand the way Cannabis and its cannabinoids work. Cannabis oil is also extracted from the Marijuana plant and used as an “alternative” medicine for medical and recreational use. While Hemp is not high in THC, Marijuana strains available on the market are rich in the cannabinoid, THC. This compound is what gives the user a “high” when activated and is used by both medical and recreational users alike. Depending on what variety of Cannabis is used (either Hemp or Marijuana) a huge variety of oils can be finally produced ranging from liquid type oils that provide a good nutritional supplement to oils resembling a sticky engine oil. These oils could potentially provide patients much needed pain management. The sub-species of Cannabis Sativa, or Hemp, is not only great for its industrial applications but also a brilliant crop for farmers. The Cannabis plant requires fewer pesticides than most commercial crops available today. It also requires only a few months to grow fully from seed to flower. The plant’s tall growth provides a canopy to the soil and the fallen dry leaves provide good nutrients for future crops. Hemp is not only a good companion plant it also has many beneficial compounds that re-enrich the soil and remove heavy metals and toxins from the soil. Recently in 2015, a study was published in Pakistan proving that the genetics within Hemp tolerate metals such as copper, nickel and cadmium. This may further move Hemp in the right direction with regards to regenerating depleted soils and helping humans clean up our scorched earth. There are extensive studies completed on the phytoremediator impact of Hemp as a crop. And many countries are using Hemp to clean up sites that have been polluted. Decontamination of some of Europe’s most polluted soils is being pushed forward by the Italians in Puglia who are using Industrial Hemp to assist with contaminated soils. As far back as the early 90’s, Hemp was used to decontaminate the soils surrounding the Chernobyl Nuclear disaster. The use of Hemp phytoremediation was used by planting large fields in areas to reduce soil contamination. Hemp is a very ideal plant to use for bio-remediation due to the fact that it grows fairly quickly, pushes deep roots inside the soil and is tolerant of heavy metals and existing pollutants, including cadmium itself. Hemp was used as an important human resource for most of our civilization. It was used to make sails, rope, as well as medicine until shortly after the turn of the 20th Century when it was banned around the world. Below is a timeline of events and laws that sealed the fate of Marijuana & Hemp’s portrayal around the world. Until recently Hemp was an almost forgotten natural resource that can be used for a wide range of applications including clothing, textiles, food, nutrition and medicine. In fact, it has over 25,000 uses and we are learning more each day. The Marijuana Tax Act of 1937 was the first major law enacted that placed tax on the sale and cultivation of cannabis. Laws and regulations had already been in place on Marijuana since the start of the 20th century and many countries started following the United States’ lead. However, ironically in 1942, the Department of Agriculture issued tax stamps to farmers as the US Army was in desperate need of the vital resources during the World War, known as the Hemp for Victory Campaign. The last Cannabis (Hemp) fields were planted in Wisconsin during 1957. With strict government regulations over this period, other crops had superseded Hemp such as cotton. In 1969, the Marijuana Tax Act was ruled to be unconstitutional as a violation of the Fifth Amendment. The Act was finally superseded by the Controlled Substances Act and repealed. 1970 is the Administration of Nixon and the beginning and start of the failed “War on Drugs”. The statute of the Controlled Substances Act (CSA) established federal grounds for the sale, distribution, manufacture, importation, possession, use and cultivation of listed substances. Cannabis, which includes Industrial Hemp and Recreational Marijuana is listed as a Schedule 1 narcotic with no medical benefit and a high potential of abuse. The major flaw in this law was that the important agricultural crop was lumped with the cousin of Hemp, Marijuana. The CSA did make an exclusion for mature stalks of Cannabis and products such as fiber, oil and cake made from Hemp seeds. There has also been much confusion between states about the legality of a cannabinoid compound Cannabidiol (CBD) which has no psychoactive compounds or less than 0.3% THC (Tetrahydrocannabinol), the active compound in Cannabis that makes you “high”. In 2014 the Agricultural Act set a milestone in the regeneration of the Hemp industry in America. 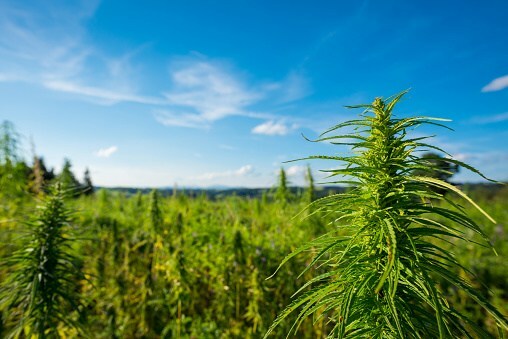 This Act redefined Hemp so that farmers could apply for licenses to grow Hemp in their state. It essentially redefined Hemp as Cannabis with a concentration of less than 0.3% of THC dry weight. Since then the surge in low THC nutritional supplements and Hemp products has grown significantly. Section 763 of the Consolidated Appropriations Act made way for regulations regarding transportation, processing, the sale of Industrial Hemp, which is grown in accordance with the Agricultural Act of 2014. The introduction and support of the 2018 Industrial Hemp Farming Act to Congress in 2017 will see America once again exclude Hemp from the CSA and allow Hemp farmers to benefit from this Cannabis plant.